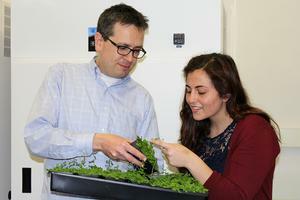 Naden Krogan and Maryam Yamadi (right) examine the model plant Arabidopsis thaliana. Credit: Brenda Chow. One of the most fascinating questions in nature is how a complex organism develops from a single cell. Naden Krogan, an assistant professor in the Department of Biology, wants to answer this question by analyzing development in plants. Krogan began his career studying plant biology at the University of Regina in Saskatchewan, Canada, an agricultural environment that provided ample inspiration for the study of how plants grow and develop. He investigated the development of a non-vascular plant, a moss, and learned to appreciate the power of using basic model organisms to broadly understand biological processes. For his PhD work at the University of Toronto, he switched to a higher plant model, Arabidopsis thaliana, which is a flowering plant closely related to crops such as canola and broccoli. This work focused on how auxin, a central plant hormone, shapes and patterns plants by initiating new tissues and organs. Krogan then went on to accept a postdoctoral research position in Southern California at the Salk Institute for Biological Sciences, a research institution dedicated to developing groundbreaking contributions to fundamental biological inquiries in medicine, disease, and genetics, to name a few. Working in such a diverse environment exposed Krogan to a wide variety of biological fields, inspiring creative ways to bring solutions to unanswered questions regarding the underlying development of all organisms using a plant model. During this time, he continued to work on Arabidopsis thaliana, studying the genetic pathways that control the production of reproductive structures such as flowers. Throughout his early academic career, Krogan learned to appreciate that plant growth critically depends on the activity of stem cells, paving the way for the work that he now pursues at American University. Stem cells, found in all multicellular organisms, give rise to other cells with specialized functions. The identity of any specialized cell type is determined by the genes it expresses or turns “on.” In the case of stem cells, most genes are repressed or turned “off” so that they can be turned on later if they are recruited into a specialized function. Often, regulatory proteins are responsible for keeping these genes turned off. However, these proteins do not work in isolation but form complexes where each protein plays a specific role. For example, one protein usually binds DNA, another forms a stabilizing scaffold for the complex, and yet another changes the shape of DNA to turn genes off. Krogan’s laboratory seeks to identify the different individual proteins, how they fit together into multi-unit complexes, and how these complexes in turn keep stem cell genes off. Krogan’s lab has characterized a number of regulatory proteins in the flowering plant Arabidopsis thaliana. This characterization has involved molecular biology, biochemistry, and genetic approaches to analyze gene expression, protein interactions, and developmental mutants. Arabidopsis mutants that lack these regulatory proteins exhibit dysfunctional stem cell activity because genes that should be off are improperly turned on instead. This causes stem cells to lose their unspecialized nature, acquire an abnormal specialized fate, and, as a result, plant development becomes completely disrupted. Disruption of stem cell function in humans similarly leads to developmental abnormalities, such as congenital defects and cancer. Further, some of the factors identified in plant stem cell regulation have close relatives in human stem cells. “What we discover about stem cells in plants could be applied to any stem cell population, even those in animal systems,” says Krogan. Other broader impacts of his research include improving food production by designing crop plants with enhanced yield and hardiness. As a flowering plant, Arabidopsis is closely related to crop plants such as rice, corn, and wheat, making scientific discoveries easily transferable to agriculture.